Two Paladin cards with Dragon synergy were unveiled earlier today. The reveals were made by Josette on Facebook. The video is in English. 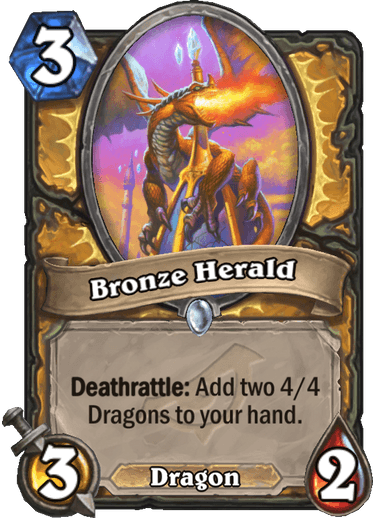 The 4/4 Dragon tokens cost 4 mana.Bronze Herald is a low tempo, but high value card. It can work really well with Cathedral Gargoyle (is it time to finally shine?!) and Firetree Witchdoctor. I am excited to see Dragon Paladin return and hopefully be stronger this time around. 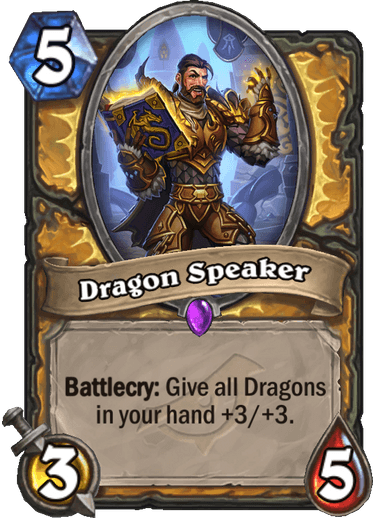 This card is simpler to assess: if Dragon Paladin becomes a thing, Dragon Speaker will probably be in it; if not, then you won't see much of this card. The problem with Dragon Speaker is that it's a massive tempo loss; in combination with Bronze Herald, you will lose tempo in two turns just to get value in the late game. And to be honest, even with a deck literally brimming with Dragons, I am not sure Dragon Speaker is even worth it. I think that handbuff dragon paladin could become a thing in wild, where you have more handbuff card so you can shift the tempo loss from turn 4/5 to turn 2/3, giving you the ability to build a nice midrange deck. (2) 1/1 buff everything on hand means playing the Bronze Herald as a 4/3 that is accettable for a 3 drop, and the Dragon Speaker at 4/6 that is better for a 5 drops. Then you have at least 2 (4) 7/7 dragons in hand, plus more dragons to come. And dragons have a full curve to play in wild. I think it can work. I wonder where dragon decks will be going in Standard as we are losing 9 dragons from the Year of the Mammoth (out of 25). This includes top cards such as Primordial Drake, Sindragosa, Cobalt Scalebane, Bone Drake and Duskbreaker. The only one I really won't miss is Temporus. So far, only 2 dragons have been revealed for Rise of Shadows, and both are class-specific. With Baku the Mooneater and the Death Knights cycling out, my Dragon Warrior deck is the only decent deck I'll be left with. After Emberscale Drake and Dragon Roar in Rastakhan's Rumble, I hoped there would be more neutral or Warrior dragons (or dragon-friendly cards) to come. The upcoming expansion opens the Year of the Dragon after all... but maybe it's just a name. For now, I'll be fine if Dragon Roar gets me Bronze Herald. Nothing fancy, but it has good value for early and mid game. However, if I get Kalecgos, I don't think I'll be happy. It is very expensive and doesn't bring much added value in a Dragon Warrior deck with only a few, cheap spells.